Prof. Tatjana Masurenko (viola) Leipzig – Germany, Hochschule für Musik und Theater F. M. Bartholdy. Prof. Betil Başeğmezler (viola) Ankara – Turkey, State Conservatory of Hacettepe University. Silke Peterson (piano) Leipzig – Germany, Hochschule für Musik und Theater F. M. Bartholdy. 1 student from Greece - Athens Megaron Chamber Orchestra. All the participants gathered at İznik Foundation İznik on 4th of September and the classes began right after the determination of the study plan at a short meeting in the morning of September 5th. All the teachers, students and their instrumants were insured for the time between 05 – 13 September 2006. A piano technician was brought from Ankara for the repairment and tuning of the piano that was rented from Bursa. He had worked on the the piano until the first day of the camp. Two faculty members gave 12 hours of classes on average everyday and the students either studied with their teachers or listened the other students’ lessons. During the camp, four of the students stayed at a hotel and the others stayed at the guesthouse of İznik Foundation. All of them had their breakfasts and lunchs at the foundation. 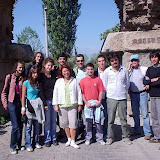 On 10.05.2006, Sunday, participants went on a trip to an ancient residential area called Elmalı Village near İznik. The museum and the historical places of Elmalı Village were visited. On the night of 11 September 2006, the participants played at the “Concert Hut” of İznik Foundation. The audience was formed by 60 people mostly from İznik and a few from Bursa. All students performed either accompanied by a piano or as viola duos or trios. Afterwards, Tajana Masurenko played a solo work by a Greek composer composed for her and the over two-hour lasting concert ended with a piece perfomed by all of the teachers and students. After the concert there was a barbecue party. 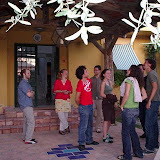 The certificates were given on 13 September 2006 evening, with a cheerful ceremony at the garden of the Foundation. Most of the participants expressed both their pleasure about the camp and also their desire for re-participating the camp next year (2007) right after their trip to back home on 14 September 2006. All the participants gathered at İznik Foundation İznik on 2nd of September and the classes began right after the determination of the study plan at a short meeting in the morning of September 3rd. The piano which was used for the lectures and the two concerts was loaned from the State Conservatory of Uludağ University of Bursa and a digital piano owned by the Iznik Foundation was used also for the rehearsals. Two faculty members gave 12 hours of classes on average everyday and the students either studied with their teachers or listened the other students’ lessons. Viola making students dealt with the maintenance of others' violas and worked in production of new violas between 10:00 am - 1 pm and 2:30 pm- 7 pm under supervision of Jurgen Manthey. Students except the ones stayed in the Hotel of Beşi Foundation stayed in another arranged hotel. But all the students ate breakfast and dinner in foundation's hotel. On the night of 8 September 2007, the participants played at the “Concert Hut” of İznik Foundation. The audience was formed by 60 people mostly from İznik and a few from Bursa. All students performed either accompanied by a piano or as viola duos or trios. On 9th of September some openair museums were visited in and around İznik. In the second concert given on 11th of September some students performed either accompanied by a piano or as viola duos or trios. At the end 17 students and teachers all together played a previously arranged work for the concert. In the evening of 11th September a barbecue party was given in foundation's garden. At the end of the party certificates were given with a joyful ceremony.